The route, as pictured in great part in the aerial photo below, shows three of the four 'Old Faithful' mountain ascents which make up the aptly named triangle of death. The start will be neutralized and controlled by a mountain biker until we reach the official start point and the timer will begin. The course begins on a foot path before connecting to an off- road vehicle track similar to the terrain typical of the P-Company 10 mile TAB route (PARAS 10). 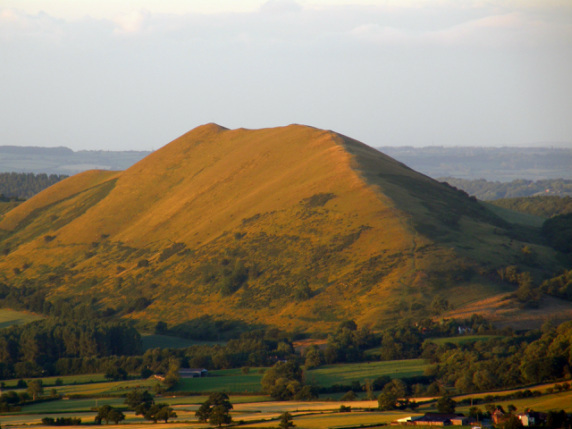 The route soon turns upwards as you ascend the shockingly steep south side of Caer Caradoc mountain to RV 1. From the RV you will have a direct line of site of RV 2 (out of the picture) which lies to the East on the rocky summit of Wilstone. From RV 2 you will have a clear view of the intervening terrain between your position and RV 3 which sits on the windy ridge of The Lawley, marked by the ever spinning weather crow. From summit Wilstone you will take the same route down to the P Company type track and follow it's undulations to the farmyard/road junction. A dilapidated narrow country lane and a overgrown wooded off road track will then take you to the base of the Lawley to begin the ascent to RV 3. 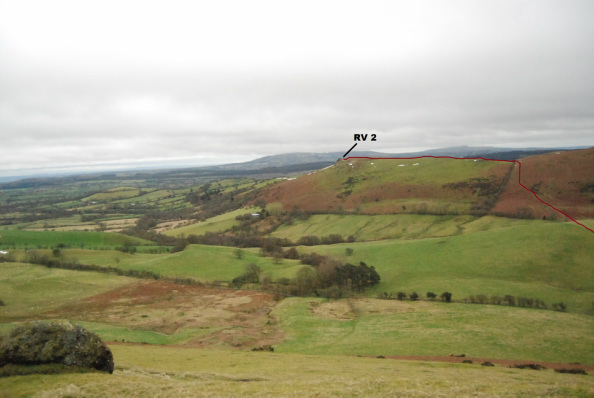 From RV 3 you will have a clear line of site of the North ridge of Caer Cardoc up to RV 4. This final climb is a true leg sapper, lung buster, back breaker and spirit crusher every bit as difficult as Jacob's Ladder which any veteran of The Winter Fan Dance will be familiar with. 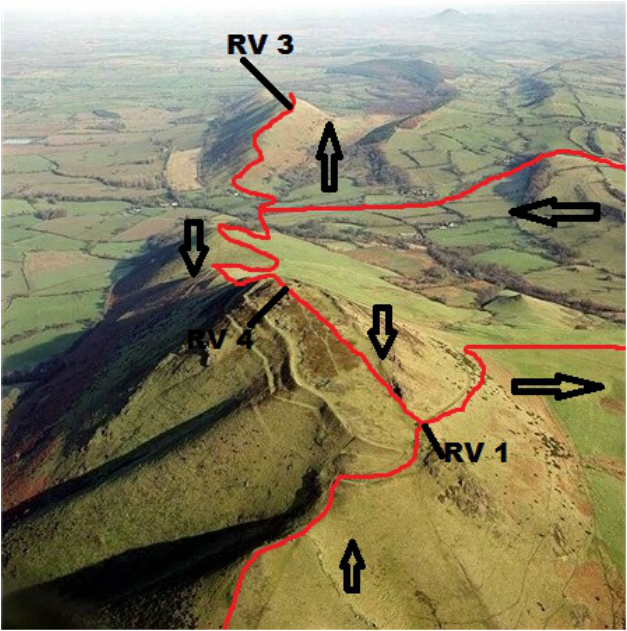 From the RV 4 mountain summit those with any 'faith' left will have one final leg down to the FRV (Final RV) back at the school in Church Stretton town. From RV 4 participants should make their way down to RV 1 (which will be abandoned by DS after first visit) and then make their own decision regarding which route down off the mountain they take. The south ridge is more precarious whereas the eastern traverse takes on more distance and will allow for a more secure and rapid going. This page will be subject to key route updates which will include all the important data; grid references, distances, elevation gain (individual and overall) and a copy of the map section integral to the route. The ascent to RV 1 is split into three distinct sections. The first is the toughest and steepest by far. The track is not clearly defined and requires you to pick your own route until reaching the kissing gate. The second segment is much like the first but much shorter, after which the ground plateaus before becoming undulating and then begins to rise again. It should be noted that RV 1 does not lie on the summit of Caer Caradoc so if you reach the highpoint you have gone too far and missed the tented RV. The first segment Wilstone is horribly steep and real hands on knees stuff until reaching the ridge line. From then on it's a steady incline to the prominent rocky summit and the Directing Staff's tented checkpoint. The ridge line ascent to RV 3 has a steep opening section before becoming a little easier. Although not the highest, the climb to RV 3 is the longest 'Old Faithful climb, and given the steepness of it's slopes strong winds are generated upwards and make it the mountain you want to get off quickest of all. The most damning feature of the Lawley's ridgline is the clear line of site up the menacing North ride up Caer Caradoc to the penultimate RV. The day's final 'Old Faithful' ascent to RV 4 is the highest toughest in it's own right. The image is taken from the half way point and the final section adjacent to the snow line is every inch as unforgiving as Jacob's Ladder. Make it to the top and it's downhill all the way to the FRV, an Old Faithful finisher's patch, and a hot brew followed by a warm hearty meal and bottle of celebratory 'Old Faithful' ale.